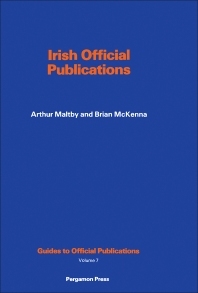 Guides to Official Publications, Volume 7: Irish Official Publications provides a compilation of guidelines and summaries concerning Irish official publications. This book examines the bibliographical mysteries surrounding Republic of Ireland government publications. Organized into 10 classes, this book begins with an overview of the various categories of Irish official publications. This text then indicates how Irish official publications may be traced and acquired, and lists some libraries with good collections. This book discusses as well some important background information in terms and symbols and specimen pages are included to illustrate the transition of a serial from the British to the Free State administration. The reader is also introduced to the weekly and annual lists of government publications together with an example of a State-sponsored document. This book is a valuable resource for students and teachers. Brian McKenna retired in 2008 as Professor of Food Science at UCD – University College Dublin, Ireland, a post he held since 1989, and became an Emeritus Professor and took up the role of co-ordinator of the European Technology Platform, Food for Life. A Chemical Engineer by training, he worked as a Research Engineer at the National Dairy Research Centre, Ireland, before moving to an academic career. In addition to his Professorship of Food Science, he served as Dean of Postgraduate and Interdisciplinary Studies at the university from 1995 to 2000 and has served two periods as Vice-President of the university, first with responsibility for Academic Planning & Development (2000-2003) and then as Principal of the College of Life Sciences (2003 to 2008). He was Editor of the Journal of Food Engineering from 1988 to 2007 and was President of IFSTI, the Institute of Food Science & Technology Ireland (1978-1980 and 1993-1994) and of EFFoST, the European Federation of Food Science & Technology (2005-2007 and 2009-2010). He received the EFFoST Lifetime Achievement award in 2010, the IFSTI Honorary Fellowship in 2010 and the ICEF Lifetime Achievement Award in 2011. He is a member of the Scientific Committee of the Food Safety Authority of Ireland, (1999-date) and is Board Chairman of the National Virus Reference Laboratory of Ireland, (2005-date) He has carried out research on physical properties of foods, rapid chilling of beef and lamb, meat texture, food safety, shelf-life prediction of foods, radio frequency heating of foods, formulation of functional drinks and drug delivery in foods. These have resulted in publication of 13 books and in excess of 150 papers.